STAGED APPEARANCE OF ANTICHRIST! THE MOST POWERFUL AND DRAMATIC SINGLE EVENT IN WORLD HISTORY! Title: STAGED APPEARANCE OF ANTICHRIST! THE MOST POWERFUL AND DRAMATIC SINGLE EVENT IN WORLD HISTORY! Subtitle: With events of the day strongly pointing to a soon appearance of Antichrist, we find it necessary to report the shocking supernatural abilities and "signs and wonders" that Antichrist will exhibit when he arises. For the first time in world history, detailed plans have been created which, when carried out, will produce Anti-Christ in such a way that will fulfill many Biblical prophecies. Further, this Plan envisions earth-shattering events in the months prior to his Appearance. We will study this exciting subject from the New Age perspective. Remember, nothing which we shall discuss today is accidental; every detail has been carefully planned out by men who are led by guiding spirits, or have received super-natural visions, or who have been involved in occult societies all their lives. The Anti-Christ's Planned Appearance will shake the world as nothing has shaken it since the death and resurrection of Jesus Christ. In fact, when you consider that the impact upon the world following Jesus Christ's death and resurrection took 300 years to fully work out, you can understand my next statement: The appearance of Antichrist will have more instantaneous impact than any event in world history. We draw upon Satanic sources to present to you the plans of the Illuminati to stage their Christ, comparing this information to Biblical prophecy. Let us start with the Biblical basis of the appearance of Antichrist. Revelation 6:1-2, "Then I saw as the Lamb broke open one of the seven seals, and as if in a voice of thunder, I heard one of the four living creatures call out, 'Come'! And I looked, and saw there a white horse whose rider carried a bow, and a crown was given him, and he rode forth conquering and to conquer." At God's appointed time, He shall allow Satan's Anti-Christ to intervene in world events. He will deceive people who do not know Jesus Christ as their Savior. This deception will be primarily spiritual, and will cause men to ultimately worship Anti-Christ. Worship is the key. Thus, you can see how critically valuable the seal is on the back of our One-Dollar bill, as we discussed in our last program. This All-Seeing Eye atop the Egyptian Pyramid denotes the supposed Ultimate Wisdom one receives once he worships Satan. This Governmental Seal on each dollar bill is damning evidence of the Satanic nature of the New World Order, because the inscription at the bottom of the pyramid, NOVUS ORDO SECLORUM, is Latin for New World Order. JESUS DESCRIBED THE EVENTS LEADING TO THE APPEARANCE OF ANTI-CHRIST AS PAIN ACCOMPANYING CHILD BIRTH IN MATTHEW 24. New Age leaders have studied these prophecies very carefully. Their goal is for Anti-Christ to deliberately stage his appearance to deceive those people who will be looking for fulfillment of Biblical prophecy before they will accept any one claiming to be Jesus Christ. These plans have been published in a book entitled, "The Armageddon Script" by New Age leader Peter LeMesurier. We will be referring to this most important book throughout this program. Matthew 24:4, 11, and 24, Jesus warned against being deceived. Deception is the Hallmark characteristic of the New Age. Nothing is as it seems, and people who are involved in ushering in the New World Order are truly not the kind of people that they seem to be on the surface. New Age writers quite boldly assert that Fundamental Christians and Orthodox Jews must be deceived. Matthew 24:6-7, Jesus warned the world would be afflicted by wars, rumors of wars, famines, and earthquakes. These events will set the stage for the appearance of Anti-Christ. The Twentieth Century has been uniquely filled with these events. Most Fundamental Biblical scholars agree they herald the end of the age. How close are we? Very close. Never before have we been moving so rapidly toward a one-world government, economy, and religion. 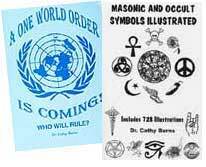 In August, 1990, President Bush and other political leaders began to announce the world had entered into the New World Order, and the march of events since then has only picked up speed and intensity. BUT ... THE LAST REQUIRED EVENT BEFORE ANTICHRIST IS SUPER-NATURAL. How does the Pope know this world-wide apparition will occur? In 1981, as he was recovering from his attempted assassination, he was suddenly visited by the Virgin Mary, who transported him back to the Fatima Vision of October 13, 1917. Pope John Paul II viewed the vision as though he had been there. However, this time, the message was different. Pope John Paul was told that he was to expect, and await, a super-natural Marian Vision, like Fatima. At this point, we need to briefly acquaint our listeners as to what occurred at Fatima on October 13, 1917. More than 75,000 people had gathered because of reports from 3 children that the Virgin Mary was to appear. She would produce a super-natural event that would validate the message she wanted to give mankind. At midday, the sun appeared less brightly than normal, so people could look directly at it. The sun spun erratically, throwing off all the colors of the rainbow, again and again. People's clothes, ponds, countryside, and the entire horizon systematically rotated with color. Then, the sun began to plunge directly toward earth, seemingly going directly into the crowd. People could feel intense heat rushing toward them. Then, at the last second, the sun stopped its downward descent and climbed back into the sky, where it resumed its normal brightness. The Virgin Mary appeared with baby Jesus. This entire event really happened, but that the super-natural power behind it was demonic. Now, understand, the world-wide Marian Vision promised to Pope John Paul will be like this Fatima vision. Christian Research Institute interviewed a Roman Catholic author, Dr. Malachi Martin, about his book, "The Keys Of This Blood", in which he talks extensively about this coming Marian Vision. Malachi Martin clearly states in this interview that the purpose of this super-natural vision is to validate the Roman Catholic church as the only true church and this Pope as God's ordained leader. This event will be most powerfully psychic. The force accompanying this vision will be so powerful it will literally bring the normal activity of the world to a standstill. Men will be so moved that their "consciences will cry out with fear". This vision is supposed to produce an "engulfing chaos, along with misdirection, and disequilibrium in human affairs." In other words, the entire population of the world will experience a simultaneous changing of their minds. This vision will be preceded by either a loud sound, a bright light, or perhaps a strong odor. These effects are identical to those which New Age writers have predicted during the appearance of Anti-Christ!! Only after this Super-Natural Marian Vision can the new official Seal of the New World Order be unveiled. How close are we? Since we have seen the first two steps to produce Antichrist already occur [NEWS1529], we can rest assured that the final three steps will soon be accomplished as well. Of course, Step 4 calls for the Pope to travel to Jerusalem to announce that, from this moment, all world's religions are one. Then, the world will under-go the greatest change of will, mind, and heart in history. The Pope will stand as the undisputed world religious leader, with a following that will be down-right fanatical. The world will then be ready for the final birth pangs which will produce the Anti-Christ, Step 5 of the New Jerusalem Covenant Project. Let us talk now about the appearance of Maitreya The Christ, the Biblical Anti-Christ, according to the occult plan. "He will start his reign on attaining the age of full Jewish maturity -- the age at which ...Jesus commenced his messianic mission..." ("The Armageddon Script", by Peter Lemesurier, p.231-232). The Anti-Christ will come in the guise of Jesus Christ, deceiving the world into believing he is Jesus Christ returned, the Jewish Messiah, Mohammed and Buddha returned, all in his person. His Messianic name will be Maitreya the Christ. [NOTE: The occult plan envisions this scenario and are quite bold in saying that his purpose is to "deceive" the whole world; you see, Illuminist planners believe all religions were created by Aliens for the purpose of manipulating mankind [David Icke, Lifting The Veil[. Therefore, all religions are not only the same, they are equally false and manipulative. The New Age Christ [Antichrist] will claim to be all the Messiah figures these various religions call for, thereby taking to himself all the beliefs of all the adherents of all the religions of the world. After gaining their trust, The Christ shall begin a period of re-training, so that, finally, all peoples of all religions will "shed" their original religious beliefs and understand that a godhead resides within each one of them. This deification of self with The Christ as the top leader, is the ultimate religion envisioned by the Illuminati. WHAT IS THE MISSION OF THE ANTI-CHRIST, ACCORDING TO THIS NEW AGE SCRIPT, OUTLINED IN THE ARMAGEDDON SCRIPT? Maitreya will require a certain period of time to accomplish his stated goals with Israel. How long is this period of time? Seven years!! (p.235) When carried out, this fulfills many Biblical prophecies which specify that the Anti-Christ will sign a 7-year covenant with Israel. (Daniel 9:27). EXACTLY HOW DOES MAITREYA PLAN TO STAGE HIS APPEARANCE SO AS TO CONVINCE THE WORLD HE IS THE DIVINE CHRIST? (2) "...When Lord Maitreya appears, he will appear as different beings to different people. Women will see him as a woman. He will appear as a white to a white, as a black to a black, as an Indian to an Indian, etc." Thus, "he will show that he is all things to all people". (Bill Lambert, speaking at Seminar, "Possible and Probable Events In The Future", Theosophical Society, Boston, Massachusetts, August 8, 1991). (3). His Three-Dimensional image will appear over all nations of the earth simultaneously. He will speak to each ethnic group in their own language. We know this is technologically possible with computer images via telecommunication satellite. (Constance Cumbey, "Hidden Dangers Of The Rainbow", p. 24-25). We also know that Satan could produce this phenomenon by his Super-Natural power alone. New Age writers clearly state, however, there will be a mixing of super-natural phenomena and advanced technology when the staging of the Anti-Christ occurs. (1). "The restored Messiah must reappear on Jerusalem's Mount of Olives at the time of a great earthquake." ("The Armageddon Script", by Peter Lemesurier, p.230-3). (Required by prophecy in Zechariah 14:4). Incredibly, according to the September, 1991, "Prophecy In The News" (p.4), an article written by Dr. J.R. Church, states the Soviet military has developed the technology to produce earthquakes in any desired location on earth. We can rest assured that the West possess this technology as well. This military technology ensures that New Age Planners do not have to sit around, waiting for an earthquake to occur in the precise location and timing to suit their plans. They can choose both the timing and location of the earthquake. We also now know that the HAARP technology of the United States can produce earthquakes at any spot on earth, at any time, at any depth, and at any level of intensity [Read NEWS1207 for full details. Also, click on Weather Control hotlink at the extreme left column on our Home Page for more capabilities of HAARP technology]. This event would literally re-create Jesus' triumphal entry into Jerusalem on Palm Sunday as would appear to fulfill prophecy in Zechariah 9:9. We are apparently at the beginning of the attacks on Jerusalem. We cannot be sure exactly when this devastation of which God foretells will occur, but Lemesurier seems to make it clear that this devastation will occur as the "starting-point". Thus, the current dispute over Jerusalem with the Palestinians might ultimately result in the devastation of Jerusalem as predicted here. New Age Leaders boldly state in their Plan to use the special effects of modern TV and movies to persuade the people of the world that Maitreya is who he claims to be. The New Age book, The Messianic Legacy, states that the only way the Messiah could be super-naturally staged in all aspects that Christians are expecting would be through the use of "Hollywood". We have listed below some of the super-natural events which Lemesurier thinks Hollywood might fulfill. (1). "Visions of a cloud-borne Second Coming, preceded by the virtual self-destruction of the former World Order." ("The Armageddon Script", by Peter Lemesurier, p.230). (2). "The Cloud of the Divine Presence must descend upon him amid thunders and lightnings." (Ibid. p.231). (3). "Sun and moon will be darkened" (fulfillment of Matthew 24:29) (Ibid). (4). "The stars will fall from heaven" (fulfillment Matthew 24:29). (Ibid., p. 238). (1). Would persuade people that historical Jesus was the Jewish Messiah, thus uniting Jews, Christians, and Muslims in faith in him. (2). Would validate occult belief that Jesus never really died on Cross, but revived in the tomb and escaped. There, occultists believe that once Jesus' wounds healed, he married Mary Magdalene, and had children by her. At the end of a very long life, they believe Jesus died as any man. And, now they are going to produce his bones as "proof" of all this. (3). Would convince world that the beliefs of the Fundamentalists were wrong. This would convince many people, especially nominal Christians who had already denied the inerrancy of Scripture and many other foundational doctrines concerning Jesus Christ. The Truth would be destroyed in minds of tens of millions. (4). Validity of Maitreya would then be enhanced because he would be firmly tied in with historical Jesus. "The Messianic Legacy", Biagent, Leigh, Lincoln, p. 370-1). + "Behold A Pale Horse", by William Cooper, p. 76. 1. A world-wide apparition of the Virgin Mary or some other uniquely Roman Catholic sign. This tremendous event would instantly unite the religions of the world, including liberal Protestant churches behind Pope John Paul II. Religiously, the world would stand as one, in fulfillment of Revelation Chapter 13. This is also consistent with the statement by the New England Director of Theosophy, that at the opportune time in world history, the Pope would go to Jerusalem to announce that all world's religions are now one, thus giving birth to the New World Order Religion. This apparition would also unite the world politically, allowing the Seal of the New World Order to be officially unveiled and approved. The organization of the New World Order Super Government would be set in place. 2. The appearance of Maitreya the Christ, the Anti-Christ. His appearance will also be preceded by a loud sound which would impact the human mind and soul. His apparition will also appear world-wide as he is physically staging his appearance in Jerusalem. Evidently, the period between these two apparitions will be filled with chaos, war, the threat of war, earthquakes, and famines on an unprecedented basis. And Born-Again Christians may experience this trouble. Even if we are taken before the Anti-Christ signs his covenant with Israel [Daniel 9:27], thus starting the Great Tribulation, we may experience these demonic apparitions and the planned chaos. We might very well go through the last birth pangs of Matthew 24 to produce Antichrist [Read NEWS1408]. CAN APPEARANCE OF ANTICHRIST BE ESTABLISHED ON 'FEAR OF WAR' ALONE? The plans of the occult are very plain in stating that Antichrist will come striding out of the death, smoke, and destruction of World War III. We have seen this quote from Lemesurier that "wars will be raging world-wide". Freemason leader, Albert Pike, received his demonic vision of 1870, revealing that three (3) world wars would be required to produce Antichrist [NEWS1056]. Former Satanists Doc Marquis and Cisco Wheeler have reiterated that Antichrist can be staged only after World War III. World events certainly seem to be leading in this direction, fueled by the interview on NewsMax.com between Admiral Thomas Moorer and Army General Singlaub [NEWS1555], which revealed that our understanding that World War III would consist of three wars: Middle East, Korea, and Taiwan. However, retired Bible scholar, Dr. Robert Amos, is equally adamant in stating his conviction that Antichrist will be produced on the world scene on the basis of "Rumors of Wars" alone. Dr. Amos believes Matthew 24:6a gives the "rumors of wars" more strength in the appearance of Antichrist than "wars" themselves. Then, Dr. Amos believes that the World War III will break out after the appearance of Antichrist, as the 10-Nation Alliance that produced him will break apart in infighting just as Daniel 2:41-43 and Revelation 6:3-4 foretell. Certainly, we can see that, in order to establish Steps 3 and 4 of the New Jerusalem Covenant Project, a period of a false peace in Jerusalem might be required. During this time, announcements of a great diplomatic breakthrough will be announced in which Jerusalem will be declared an internationalized city, and the Palestinian State will be established. The purpose of the internationalization of Jerusalem shall be to create a combination worship center in which adherents of all three Monotheistic Faiths can worship together in peace and harmony in a new combination church. This scenario is Step #3 [NEWS1529]. When the Roman Catholic Pope travels to Jerusalem to declare all world's religions are now ONE, Step 4 will have been completed. A brief period of relative peace and tranquility may then transpire, and people the world over will be saying, "Finally, we have Peace and Safety". But, just as the Apostle Paul warns in 1 Thessalonians 5, all hell will suddenly break loose, beginning the planned World War III. If you see such a peace unfold in Jerusalem, do not think it will be permanent. Do not be deceived on this point. Warn as many people as you can that this "peace" is false, and that the region will soon be plunged into all-out war. We shall just have to wait to see how events transpire. The world is about to be deceived mightily just as Jesus foretold in Matthew 24:4, 11, and 24. The only preparation is spiritual. If these New Age Plans come to fruition, they might be fulfillment of Paul's prophecy in II Thessalonians 2:9-12, "The one who is coming (Anti-Christ) is in accord with the activity of Satan, with all power and signs and false wonders, and with all deception of wickedness for those who perish, because they did not receive the love of the truth so as to be saved. And for this reason, God will send upon them a deluding influence so they might believe what is false, in order that they all may be judged who did not believe the truth, but took pleasure in wickedness."